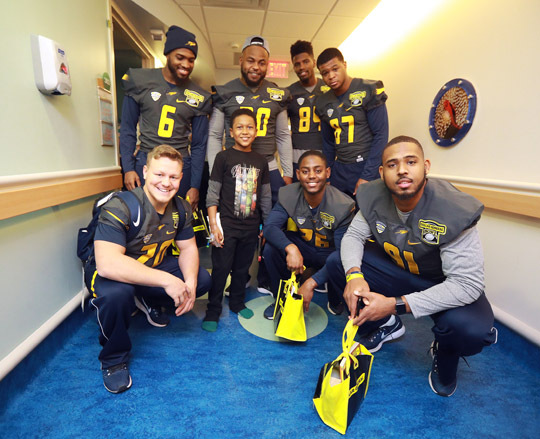 The Toledo Rockets completed their first practice Wednesday afternoon in Mobile in preparation for Saturday’s game vs. Appalachian State at the 2017 Dollar General Bowl. The Rockets practiced at UMS-Wright Prepatory School for about 90 minutes before returning to their hotel. 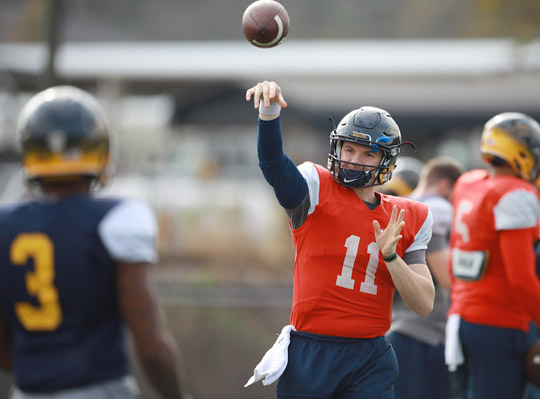 Senior quarterback Logan Woodside and the Rockets practiced Wednesday in Mobile, Ala.
Head Coach Jason Candle said the practice was a good start for the Rockets (11-2), who have not played since defeating Akron for the MAC Championship Dec. 2. “We had a chance to acclimate ourselves to warmer weather,” Candle said. Highs in Mobile reached the low 70s Wednesday, with high humidity and scattered showers. Earlier in the day, seniors on the team delivered toys to children at the University of South Alabama Children’s and Women’s Hospital. The Rockets ended their day in a bowling competition vs. Appalachian State. Toledo rolled by the Mountaineers and will bring home the bowling trophy. On Thursday, the Rockets will have a brief morning practice, followed by a tour of the USS Alabama in Mobile Bay. Seniors on the team visited patients at the University of South Alabama Children’s and Women’s Hospital. This entry was posted on Thursday, December 21st, 2017 at 1:14 pm and is filed under Athletics, Events, News .